Welcome to the Crafty Individuals November challenge and I have been lucky enough to choose the theme for November, so I'm really hoping you are going to join our amazing team in showing some sparkly, festive projects. I loved making this project this month. I always wish for snow at Christmas and this was the inspiration for my piece. Firstly I stamped plate CI - 138 with Versamark dazzle embossing ink and used sparkly EP on it. Luckily found a punch that almost fitted the snowflake and good enough to use. 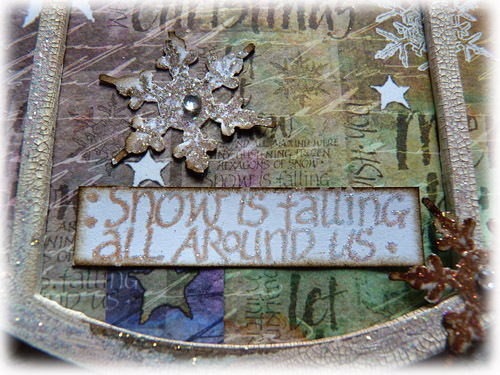 To get variations on a theme, I inked the snowflake part of the stamp with walnut stain DI and the Versamark ink, again using the sparkly EP, and this gave me a very different look. Using this technique I made quite a number of snowflakes for embellishments. A Tando frame was painted white, when dry it was sanded, painted in places with picket fence distress crackle paint and inked with vintage photo. I also added some Stickles to it. 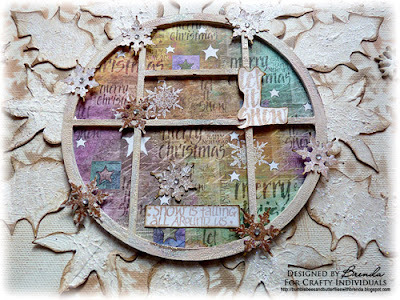 The background for the frame is paper from the CI background papers Bk 2 for Christmas. The canvas is 30 x 30 cms. I gave it a cover of gesso creating some texture in it, when dry I used PanPastels and a mask to create the background. At the same time I gessoed some chipboard snowflakes and added PPs to them too when they were dry. I also set about making a large snowflake as the backdrop to the coloured centre. 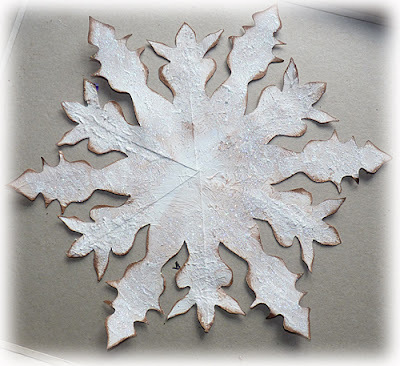 This took me a while as I cut piece of card with an angle of 30 degrees to make a template for the snowflake arms then cut 6 of these and stuck them together. This was also covered with gesso creating rough texture in it. When dry I added PPs and then more gesso over the top sprinkling glamour dust all over it to dry in. Again when dry I inked the edges with walnut stain to create a border so that it would stand out more on the canvas. When put together I added some gems to the snowflakes and eh voila my own festive sparkle snowstorm. I think this will look good in my conservatory or dining room this Christmas. Have fun making your own festive sparkle project and join us in the challenge. There is some fabulous inspiration already on the post and more will be coming over the next few days/weeks. Jean is again offering a massive 25% discount on shop products if you enter the challenge this month, that's everything on the website, including the stamps. Woo hoo gotta be worth a look don't you think? Yay it's Friday, the weekend starts here. Positive thoughts to everyone who has been affected by hurricane Sandy, I am so thankful that my UPA teamies who live in the area are safe. Oh Brenda this is stunning. The walnut stain really makes the snowflakes and background even more snowy if that were possible! I think it's because it looks like it might have melted slightly. The choice of beautifully coloured background paper is inspired too. Bet it will look a million dollars in your conservatory. Oh Brenda - I'm afraid it's not going to look good in your conservatory this Christmas! It's going to look GREAT!! It's gorgeous matey. Oh my goodness Brenda, that's stunning! 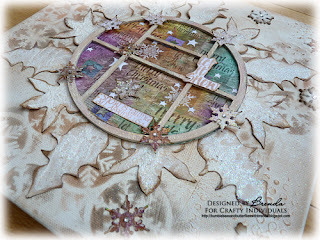 This is so beautiful, Brenda - your background is stunning, and I love how you've used the circular frame - gorgeous distress! Wonderful challenge theme too, thank you! 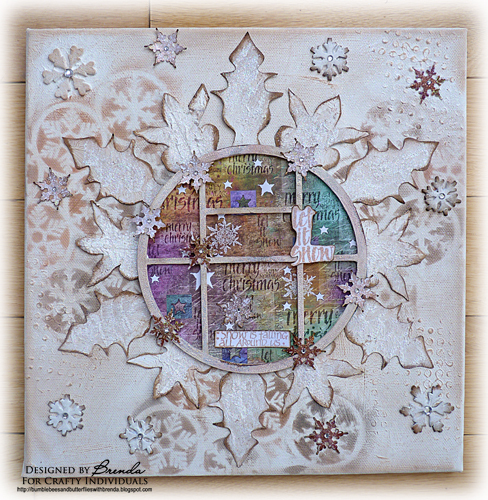 Gorgeous card, Brenda, with some great techniques! 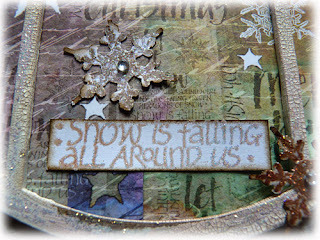 I do love snowflakes on cards.....just not for the weather. It is the thought process behind it all and the way you incorporated a variety of products that can be purchased from CI. Gorgeous project, it will look wonderful on the wall for Christmas. Lovely winter canvas, perfect for Christmas! This surely will be great for your dining room at Christmas! Hope Becca is doing well?? This winter canvas is totally gorgeous and will grace any room you decide to hang it in. I love the way the circle is divided and frames the various elements of your canvas. I think i am going to have to invest in some gesso...It really gives a nice 3 d relief element! Gorgeous...love the window and the wonderful color and images inside! COOL PROJECT! Your design is beautiful. The Bg has a purity about it, but your centre window is the pièce de résistance. Love your beautiful canvas Brenda. What a nice work. Really Christmas time. wow, a gorgeous christmas canvas! Have a nice weekend! Breathtaking canvas, Brenda! Stunning project for Christmas and I would hang this beauty where everyone who enters can see. Love the background and that focal snowflake! Beautiful!!! Hugs! 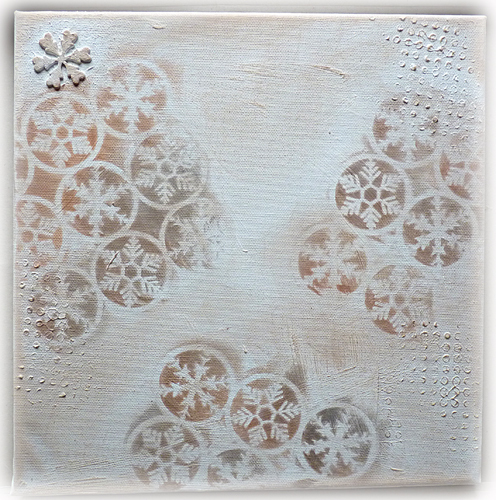 What a fabulous festive canvas Brenda, I love that huge snowflake and all the sparkle ! What a beauty and the center of the snowflake is so pretty with all the added colors! Hope your Granddaughter is doing better. her cards on its way ,poor thing. Brenda, this is over the top beautiful! Love the soft distressed colors of the frame and base, and that beautifully blended background. A stunner! How cool, that's a wonderful idea and a fabulous look. Gorgeous piece, Brenda, so inventive ! What fun and looks great too! I'm very behind with my visits I'm afraid so I've looked at lots and I'll comment on my favourites. This is certainly one of those. Brenda it's beautiful and so inspirational. I aspire to produce wonderful work such as this and will be back to look at your detail photos again! I adore the crackled frame.